My goal: Long: Meet a sweet attractive feminine woman for a long term relationship. Short: Make new friends, work and have fun till then! Free Time: Read, swim/water sports, sailing, travel, wine tasting, cooking, explore new/different restaurants/cuisines around the city, enjoy time with friends and family, comedy clubs. 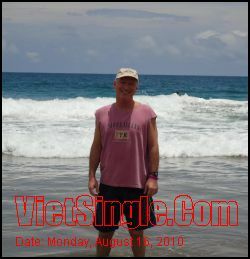 I Am: I am a fun intelligent successful American Caucasian (My Trang) who likes to stay fit. Pursue travel/adventure especially in foreign countries. I work very hard in a successful career but try to make time to relax and enjoy life also. Cam on for reading my narratives. Looking For: Sweet honest attractive woman who takes pride in her appearance but no models please. Looking for a long term relationship with the right woman who will spoil me as well as I spoil her! I believe that two of the right people together are better/stronger than either one alone.